Guests as well as members will be greeted in a spirit of hospitality and welcome. You will be provided with a worship bulletin that will guide you through our worship service. Those worshiping with us for the first time will be asked to sign the worship registers and to include your address, email and telephone information so that we may acknowledge your visit. Visitors will not be singled out in any way. We invite all visitors to join us for Sunday morning education classes for all ages. Classes meet from 9:45 a.m. until 10:45 a.m. Join us in between services for coffee, muffins, and conversation in the area overlooking the Fellowship Hall, through the parlor when you exit the sanctuary. We hope you sense God’s warmth and hospitality during your visit. 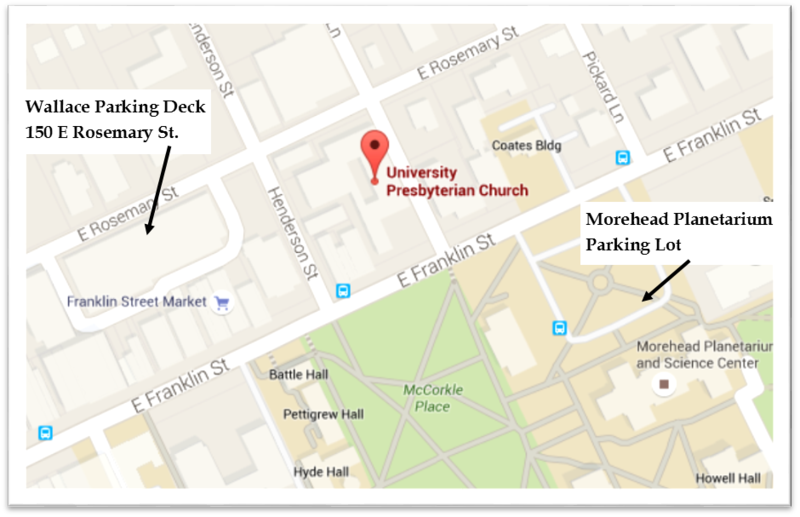 On Sundays, parking is free of charge in the Wallace Parking Deck off East Rosemary Street, the Morehead Planetarium Parking Lot on East Franklin Street, and along the streets. 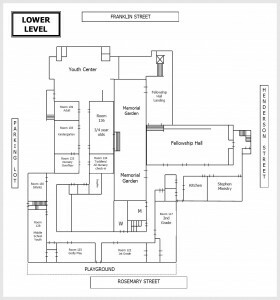 The main church entrance is 209 East Franklin Street and the secondary main entrance is 110 Henderson Street. 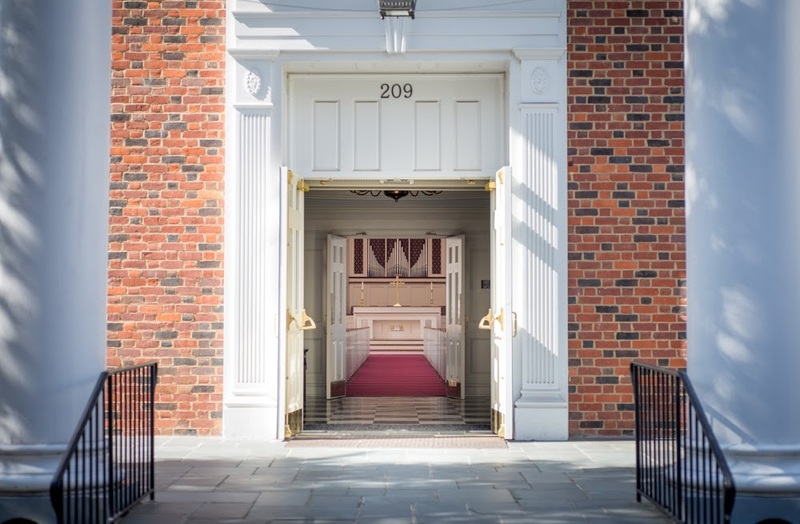 During our construction phase, handicap parking spaces are located in front of the sanctuary along Franklin Street, and before each service members are ready to assist those who need help getting into the building. 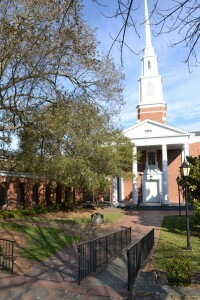 University Presbyterian Church welcomes all people. 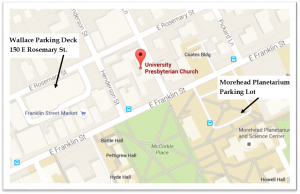 Handicap parking spaces are located in front of the sanctuary along Franklin Street, and before each service members are ready to assist those who need help getting into the building. Additional handicap parking and senior parking is available in our parking lot. 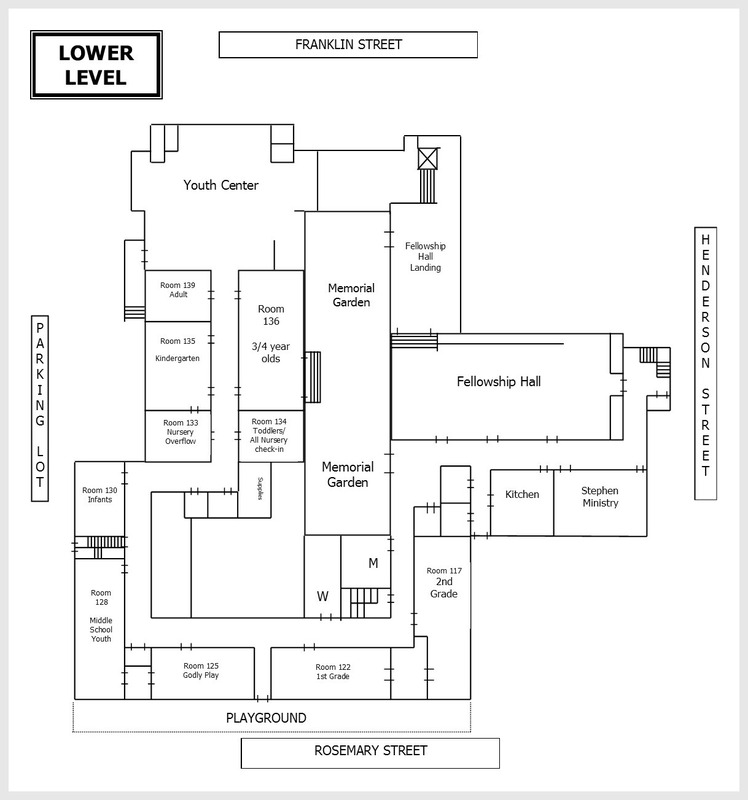 There is a ramp from the Franklin Street entrance into the building, and the elevator can be found in the parlor, next to the sanctuary. 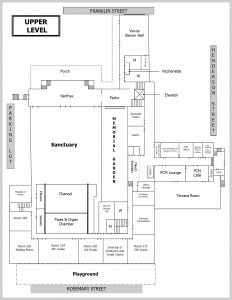 Large print bulletins are available for both worship services, and a hearing loop is in the sanctuary. If you need assistance, speak with the greeters as you enter the sanctuary. Childcare for infants and toddlers is provided for all worship services and Sunday School. No reservations are needed for childcare during worship and Sunday school. Infants and toddlers are cared for by trained, competent childcare workers who genuinely love children and focus on helping them, and their parents, feel secure while in the church’s care. We are always delighted to welcome children into our worship. Children are welcome to stay with their families throughout the worship service. 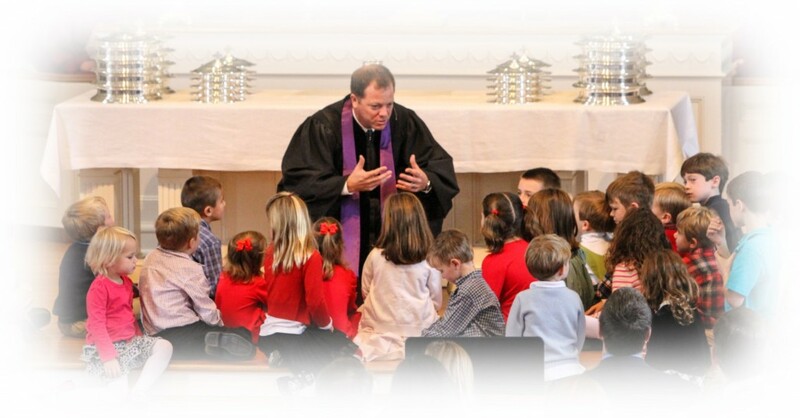 At UPC, children are valued as vital members of our community of faith. Children’s worship bags can be found at both the front and back entrances to the Sanctuary. At 8:30 and 11:00 a.m. a special part of our worship service for children, who are 3 years old through 3rd grade, is called “Time With Children.” Children are invited to come to the front of the worship space to join a church staff member to talk about some aspect of our life together. 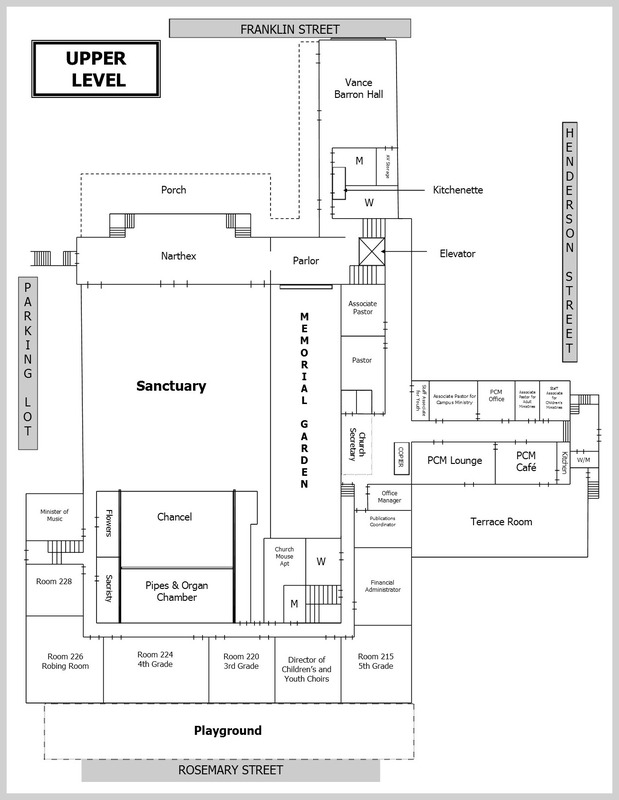 After coming forward, children in kindergarten and younger are welcome to remain in the Sanctuary with family, or may go to the nursery or Godly play.